Zimonjić takes a shot during the Citi Open semifinal. Photo: Christopher Levy. 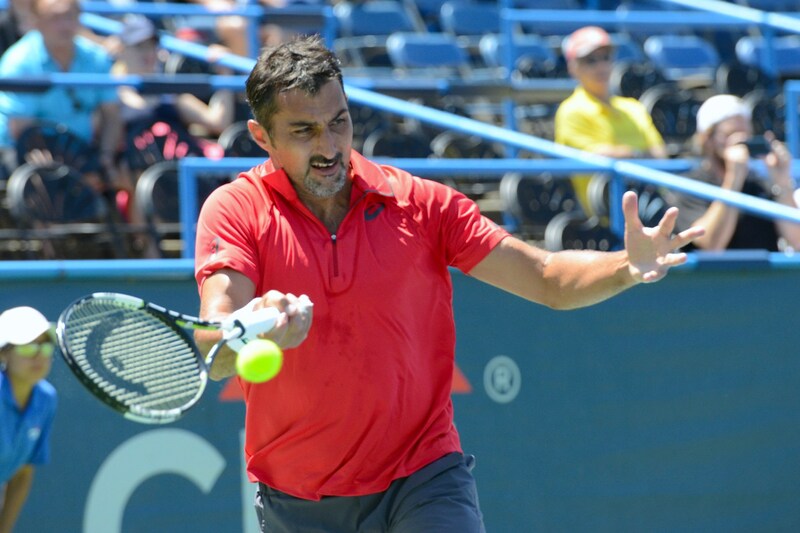 I had a chance to sit down with Nenad Zimonjić at Washington’s CITI Open, a tournament he first attended in 1999 and has subsequently won twice (2011 and 2013). While we spoke, the Serbian doubles specialist was watching the quarter-final between Dodig/Melo and Lopez/Mirnyi, sharing observations about tactics and execution with both Marcin Matkowski and his trainer Vlade Kaplarević. Naturally, that’s where our conversation started. A version of this interview was published in Serbian by B92. AM: How often do you get to scout your potential opponents like this and what kinds of things do you look for? NZ: Any kind of detail: who is struggling with which shot, what they try to do on the big points, if there are any specific plays they use, where they like to serve, where they like to return—stuff like that. AM: Do you get a chance to do this at every tournament? NZ: Not at every tournament. Sometimes, you can watch on the TV screens in the locker- room or lounge; sometimes, you have indoor events where you can just go to the court and sit, which is quite convenient. Here, I just finished my practice and they’re playing; so, I don’t mind coming out for a little bit. AM: If you didn’t have a chance to watch them live, would you go on YouTube the night before to look for clips, or is this viewing sort of a bonus? NZ: No, I wouldn’t—because I know all of them quite well and I’ve played against all of them many times. So, only if it’s a team I’ve never heard of or never played against, then I try to do a little research and get as much information as I can. After a tightly-contested match, it was the Roland Garros champions who prevailed, 10-7, in a super tiebreak. Although Zimonjić had faced the current #3 team with other partners over the past three seasons, Saturday’s semifinal was the first time for the Polish-Serbian duo. It didn’t go well: the straight-set loss to Dodig and Melo included the first bagel set for “Ziki” in over four years. Their previous round quarterfinal against the Colombian pair of Cabal and Farah, which seemed headed for a straight-set win, got unnecessarily complicated after an intervention by Chair Umpire Paula Vieira Souza. So, I had to ask. AM: What happened on your serve at the end of the second-set tiebreak? AM: Since there isn’t “Hawk-Eye” on that court for a challenge, did you think of calling the supervisor? NZ: You can’t change anything; it’s the umpire’s call and that’s it. But if they do an overrule, they should do it way earlier—right away. She said she was waiting to see if the line judge was going to call it. Why wait? Even if it’s the same call, you should say it out loud. AM: Even before the season started, you had a setback with Michael Llodra’s injury and surgery. Then, Qureshi, your first substitute partner, didn’t work out. It’s been better with Matkowski, and you guys are #7 in the doubles race, but you haven’t won a title yet. How would you assess your season so far? NZ: Like you said, it was unpredictable. It was something that I was hoping for: to play with Mika again after some time, because I thought we played really well together; and he was going to play only doubles, so that was a perfect opportunity for me. But then, it was unlucky that he needed the surgery; he’s been out since then and I don’t know if he’s been practicing a bit, whether he wants to come back or not. He’s been doing a little TV commentary and some other things, so we’ll see what’s going to happen. At that point, the beginning of December, all the teams were set up; so, the only guys who I could actually ask were those in a partnership with a singles player, because that’s easier to get out of. Qureshi was one of the guys, so I asked him to play. I had to change the side I was playing and it didn’t start very well. I was expecting more from that, to be honest; it wasn’t a long time, but I felt like it was better to switch early… With Matkowski, I started playing at Indian Wells and that worked out well from the beginning—we started by making the semifinals there… In the past, Marcin didn’t have much success at Wimbledon, so making the quarterfinals, losing to [eventual champions] Rojer and Tecau, was his best result. AM: Looking back at last year’s successes, being the #2 team for most of the year, do you have any second thoughts about the decision to end things with Nestor? NZ: No, not really. Maybe [under different circumstances] I would have thought more after the US Open about what I wanted to do, whether I want to continue or not. But we didn’t have the communication that I wanted on the court: talking about tactics or things that we should work on, stuff like this. And the opportunity to play with Mika—somebody I’ve played with in the past, is four years younger than me, and wants to play only doubles—made it a very easy decision for me to make… I think it was good that Danny and I played together last year, but for this one I definitely needed a change. AM: Davis Cup didn’t go very well. What do you think went wrong there? With Novak pulling out and Tipsarević unable to play, was it kind of a combination of factors? How much did Troicki’s Wimbledon loss (to Pospisil, after being up two sets) weigh on him? NZ: He knows best how it was. I think he was very confident, and very close—one set away—to making his best result at Wimbledon: quarter-finals. So, he was playing really, really, well and it’s a pity he didn’t make it. Then again, he’d played many tournaments in a row and the conditions [in Buenos Aires] were for sure something he doesn’t like: very slow clay. They used that to their advantage, which is normal, and they chose it perfectly—it was much better for them. What affected us there is that Viktor didn’t win that singles match on the first day—he had a chance, being up two sets to love and kind of cruising through the match…. So, that affected the next day: that he lost, that it wasn’t one-all, and that he was physically a little tired. These guys played unbelievably: [Leonardo] Mayer was on fire in the singles the first day, and also in the doubles, and [Carlos] Berlocq played really well, too. We basically didn’t have any chance. Of course, if Novak was there, it would have been completely different. Then again, if Viktor had won that first day, it would have been a completely different doubles match. So, it’s a pity; but they were a better team & they deserved it. AM: With 2016 being an Olympic year, it makes Davis Cup even more complicated. Will Team Serbia be able to give a full effort? NZ: Well, I don’t know. I’ve always played Davis Cup—I don’t remember when I last missed it. So, for me, it doesn’t really matter; I’ll try to help the team. We’ll see in September which opponent we’ll draw in the first round and about the schedule— everything changes because of the Olympics. Hopefully, we’ll play at home, which make things a little easier. AM: Four men are in contention for the ITF presidency and they’ve each proposed changes to the Davis Cup schedule & format. Do you have any thoughts on what could be changed to increase player participation and improve the event? 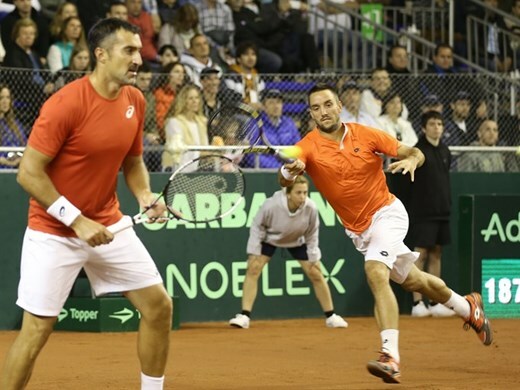 Serbia lost to Argentina 0-3 in the 2015 Davis Cup quarter-finals. Photo: Sergio Llamera. NZ: I think Davis Cup takes a lot out of you—first, the days of preparation and then the tie itself, over three days. What could be changed is to play best-of-three sets instead; that would make a big difference to the players participating. Also, we could have two additional players on the team: to have five or six guys that you could substitute. That would make it much easier on the top guys, if they decide to play, because then they know they might only have to play one match. Also, maybe it could be played in two days, like Fed Cup is doing. AM: At least one candidate has suggested playing all of them in one location, like the World Cup. What do you think about doing away with home-and-away ties? NZ: This is a tradition that I think should be kept, so the countries that don’t have big professional tournaments get to see top players. This is very nice—and good for sports. Then again, maybe every few years, like the Olympics, we could alternate and have a world championships somewhere, playing a format like they used to do [at the World Team Cup] in Düsseldorf. That was a good competition. AM: Over the years, you’ve played with so many greats of the game. 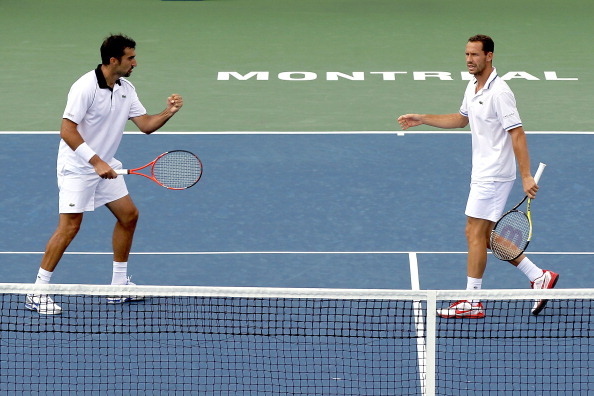 What do you cherish about playing with guys like Santoro, Paes, or Nestor himself? What did you learn from veteran players in your 20s & early 30s? NZ: Every time I had a chance to play with a top guy, it was a huge experience. The first one like that who asked me to play was Wayne Ferreira, then one of the “Woodies” asked me to practice. Playing against them or playing with them, you always try to learn something, to improve as a player by seeing what they do better. From each partner, you can learn something new and use it for yourself. For me, playing with Henman in Monte Carlo and winning my first Masters series title [in 2004] was like that. It was really nice. Different personalities, different styles—that’s what’s made me a better player now. I’ve played different sides, with more or less aggressive players, lefty, righty, players with more feel, somebody who doesn’t serve big (so you have to be ready with your volleys)—everything. Over the years, it helped me a lot that I played with many different partners. AM: In most cases, do you feel like you were learning primarily through your own observations? Were any of your partners more actively mentoring or advising you? NZ: Yes, sometimes. As partners, you try to help each other—saying some tactical or technical things. Then, through this, you learn from them, seeing what they are doing when they’re playing points. If you make some mistakes, then you talk about it and try not to do the same again. So, these are the things that help you a lot as a player. Sometimes, when you’re not sure what to do, you can even ask, “What do you think? What play should we use?” This is where [communication] can be very helpful. AM: When you’re playing on the ATP tour, unless you’re with Nestor, you’re usually partnered with guys about five years younger. But when you’re playing Davis Cup, some of your partners are significantly younger—for example, Filip Krajinović. In a case like that, when there’s more than a fifteen-year difference, are you more aware of passing on lessons? NZ: For sure. In all the Davis Cup matches, I’m going to be the leader of the team because I’m more comfortable in doubles and I can help them a lot. So, I have to think tactically— knowing what they’re capable of, what they can do—and try to encourage them to play their style but, at the same time, to play in a way that I can help them. AM: The US Open is not your most successful Slam. Do you go into it thinking differently because of that? Is there anything particular you’ll do to prepare for the North American hard-court swing this year? NZ: First, it’s a big adjustment: the courts are quicker, the balls bounce much higher after grass… So, it’s a huge adjustment and you have to be ready for it. The second thing is the weather: it’s extremely hot and can be humid here and in New York; so, practicing in these conditions is something you try to focus on. The reason why you come a little earlier to the tournaments and use this [Washington] tournament as great preparation for Montreal and Cincinnati is that there, we have a “bye,” so we’re going to play a tough first match, whoever goes through. The cut-offs [at the Masters] are extremely tough and these guys will already have played one match. Every match that we play here is beneficial for us—and, so far, it’s going well. Also, I would say Marcin feels most comfortable on hard courts and indoors; so, this part of the season now should be good for us. I’ve had success at these tournaments everywhere but the US Open. I felt like I’ve been playing good at the US Open but was just a little unlucky—last year, for instance, with the heat. So, I can’t be unsatisfied with the way I’ve been playing there—I just have to make sure that I work hard and come there ready. Marcin had his best [Slam] result in New York, where he made the finals. So, he knows he can play well there. We’ll see. AM: Are you guys actively thinking about the World Tour Finals in London? NZ: For sure, that’s one of the goals. We’re #7 in the race, even though we started in Indian Wells. Then, there are some new teams… Right now, you can say that four teams have already qualified: Dodig and Melo, the Bryans, the Italians [Bolelli and Fognini ], plus Tecau & Rojer. Currently, fewer than two thousand points separate the doubles teams ranked 5-12 in the race; so, it’ll be a fight to the end of the season for the final four spots. In Montreal, Matkowski and Zimonjić are the fifth seeds and will play the winners of a marquee first-round match between Australians Hewitt and Kyrgios and Frenchmen Monfils and Tsonga. This entry was posted in tennis and tagged Citi Open, Davis Cup, doubles, ITF, Nenad Zimonjić, Washington, World Tour Finals by amitric. Bookmark the permalink.